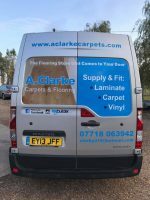 A Clarke Carpets & Flooring are a leading mobile carpet and flooring supplier/fitter with flooring options to suit all budgets. Being a mobile business with minimal overheads enables them to stand very competitive on prices. A Clarke Carpets & Flooring was founded in 2012. Aaron completed a full 2 year apprenticeship and spent the following 7 years working for a top Carpet fitting company before branching out on his own in 2012. Aaron has spent the last 3 years building a reputable name for himself and his company. His 10 years experience, huge client base and long list of excellent reviews speaks for themselves. A Clarke Carpets & Flooring pride themselves on being able to bring all the samples to your home to choose from comfortably and compare to existing home decor. They take time to measure every job carefully and find the flooring that best suits your needs. Let A Clarke Carpets & Flooring take all the stress and hassle away. No being pestered by salesman in stores. No trying to second guess matching current home decor or trying to visualise colour matches. No wasted time travelling to stores. A Clarke Carpets & Flooring are here to help! And best of all….they won’t be beaten on price! Don’t delay…Get In Touch Today!